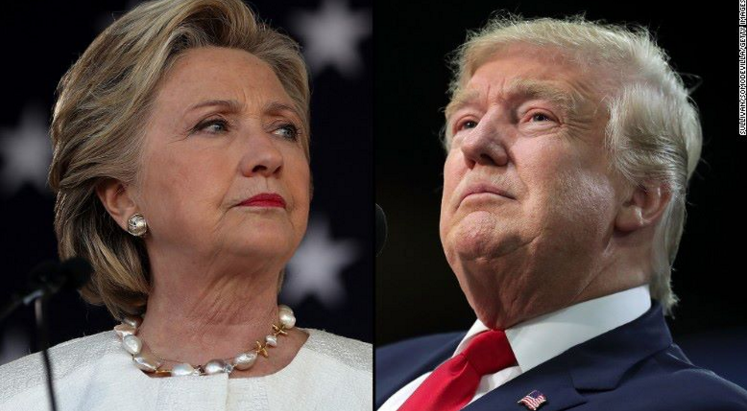 Donald Trump and Hillary Clinton finished the election cycle with the worst favorability scores in history since Gallup began recording the measure in 1956. A Gallup poll published on Wednesday, one day after Election Day, reveals that Trump has the highest total unfavorable score (61 percent) and the lowest total favorable score (36 percent) in presidential polling history. His former rival Clinton comes second on the list with a total unfavorable score of 52 percent and a total favorable score of 47 percent. Former presidential nominees with high total unfavorable scores include Barry Goldwater in 1964 with 47 percent and Mitt Romney in 2012 with 43 percent. "The 2016 election is the only one in Gallup's polling history to feature two broadly unpopular candidates," Gallup writes. "Further, when factoring in the high percentages viewing each very negatively, Trump and Clinton are the two most negatively reviewed U.S. presidential candidates of the modern era, and probably ever." "There has been a trend toward harsher ratings of candidates in recent elections," Gallup goes on. 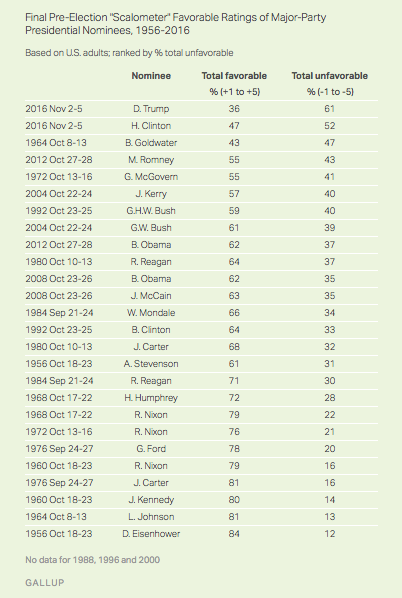 "Indeed, as Gallup noted in June, no presidential candidate since Ronald Reagan in 1984 has ended a campaign with a total favorable scalometer score above 70%. "But even in the last two elections, all candidates enjoyed total favorable scores of 55% or higher, far better than either candidate today." Trump and Clinton are already hard at work to repair their images with the American people, the now President-elect beginning with his acceptance speech late Tuesday night and Clinton with her concession speech Wednesday morning. Trump congratulated Clinton for "a very, very hard-fought campaign" and commended her years in public service. Clinton similarly congratulated Trump on his victory and urged her supporters across the country to have an "open mind." "Donald Trump is going to be our president," said Clinton. "We owe him an open mind and the chance to lead."